Adults might know it as the “Batcave” from the 1960s campy television series, Batman. 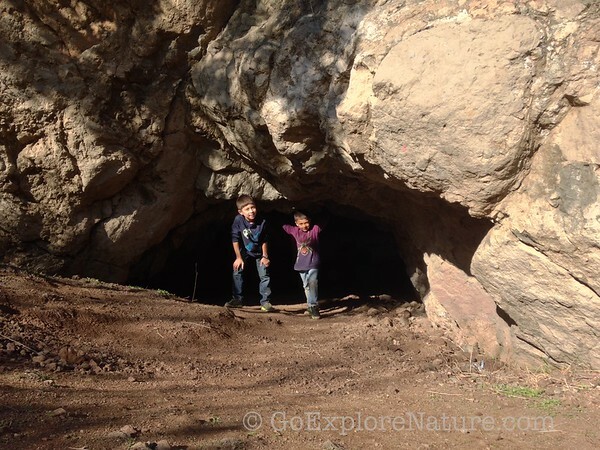 And kids might get a thrill out of exploring a cave in the heart of Los Angeles. 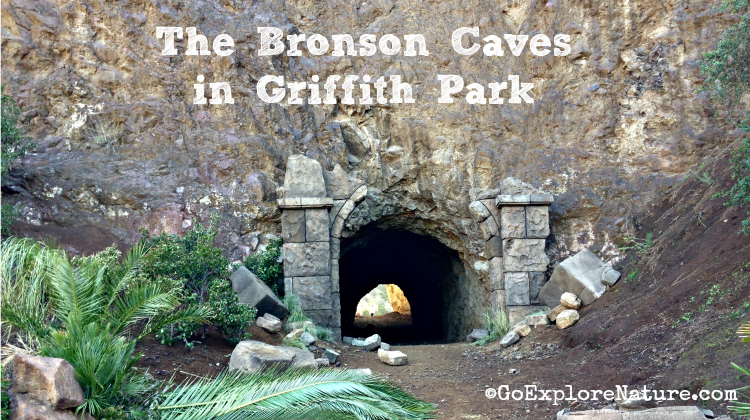 But while the Bronson Caves in Griffith Park are still a popular shooting location for films and television shows, you won’t find either bats or Batman’s secret lair here. What you will discover, however, is a family friendly, short hike to the cave made famous by Batman and still in use today. In fact, when we visited, there were film crews setting up for a shoot the next day (hence the palm trees and stonework around the cave entrance in the photo above)! It’s a short walk from the trailhead to reach the cave, then another 50 feet to completely pass through it. The kids will find it loads of fun to explore in the semi-dark. Don’t worry about it being too dark or scary – you won’t even need a flashlight. There are three separate exits worth investigating, including one just the right size for the littlest explorers. The real fun actually begins when you exit out the cave and discover what’s waiting on the other side. One look up and you will see that there are lots of short, narrow, steep paths leading up the hills that surround the cave. 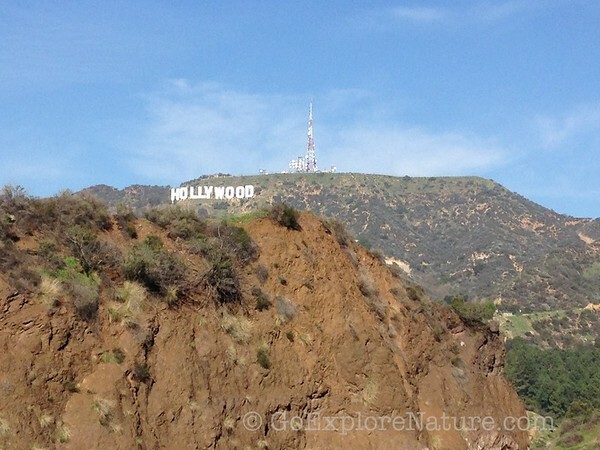 If you make your way up one, you’ll have a fantastic view of the iconic Hollywood sign, at least on a clear day. Even more fun for the kids? Sliding back down instead of walking. Turns out the hillsides are covered in a mixture of dirt and small, loose rocks. 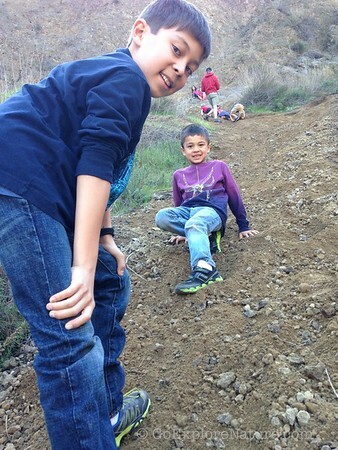 Which makes for natural dirt “slides” perfect for little butts to ride down. 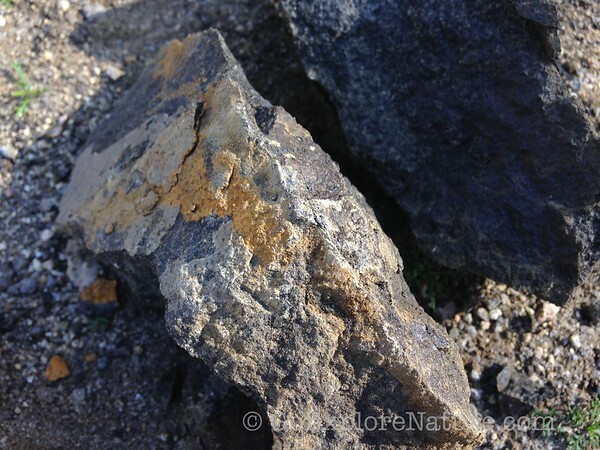 Just be careful – the dirt here is hard and the rocks loose. A few scrapes and scratches are to be expected. And probably not a good idea after it rains. We did a little research when we got home and learned that this area was once a quarry used for the excavation of crushed rock for the construction of city streets. The caves are manmade, created as part of the excavation process. As you might have guessed, there are plenty of rocks around to play with. The boys tried stacking rocks, then pounded them together to see what would happen. Turns out, these rocks are perfect for breaking apart and smashing into little pieces, which provided for lots and lots of entertainment. When you’re finished playing in and around the caves, head back down the way you came. If you like, you can finish your hike with a picnic at one of the tables at Bronson Canyon Park, just steps from the parking area. From Franklin Avenue in Hollywood, head north on Canyon Drive. Continue to the end of the road at Bronson Canyon Park. After entering the park, proceed all the way to the end of the street. You’ll pass a parking area on your right before reaching a smaller lot on your left (marked “Camp Hollywoodland”). If neither of these has any spots, you can also park on the street – just watch posted signs to make sure you don’t get a ticket. There’s no sign here to mark the trailhead, which is confusing because there are two paths to choose from. 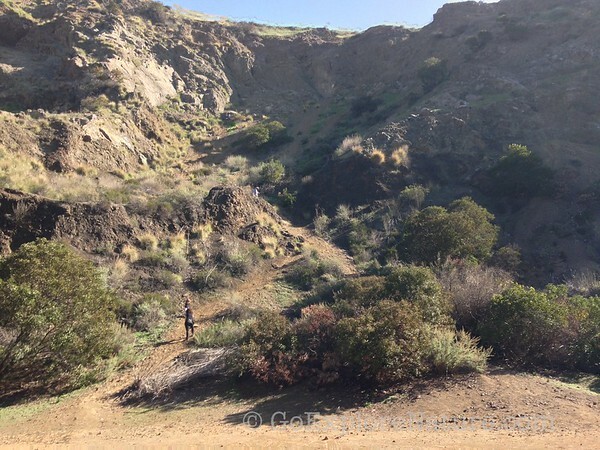 Opt for the wide fire road to your right – the other is a much longer trail that takes you to the Hollywood sign.